Optimism was flowing at the conclusion of an intensive 5-day FIFA/OFC Intructors Course at the OFC Academy in Auckland with both FIFA experts as well as participants walking away well pleased with the outcomes. Now it’s time for the 18 particiapting coaching instructors to return to their respective member associations and pass on the tools they have been given in order to increase the level of coaching across the Pacific. 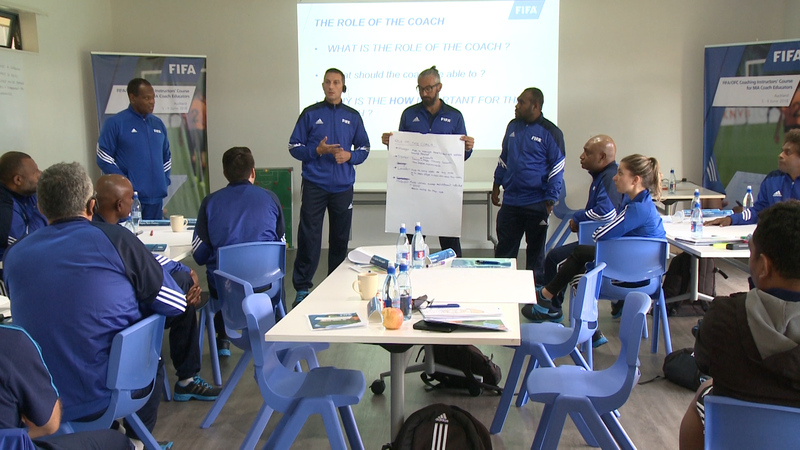 Although the six FIFA experts were keen to stress the course was only the initial step in a long journey, they all expressed their confidence about the future of coaching development in Oceania. FIFA Senior Manager for Technical Development Jean-Marie Conz was impressed with the attitude of the particiapants. “We have good candidates, especially in terms of motivation, they are all keen to learn and become better and that’s the basis for learning and that’s very important for us instructors. “In terms of the level of knowledge we can see there are some differences between the member associations but they all showed the ability to improve,” he said. Course participants representing nine of Oceania’s 11 member associations were just as enthusiastic about the potential of coaching education in our region. “We have to progress if we want to stay at the top tier in our region, but I also want to say it’s important to work together as Oceania,” Tahiti’s Patrice Flaccardi said. “We have our own coaching style in Tahiti but the message I can give to my own Federation from what I’m learning here is that other countries work very hard on their football development. “The intensity and the diversity of the instructors is very good for us because we have a lot of exchanges in terms of all aspects of the game and regarding the content it’s very interesting because we are here to get clear guidelines from OFC and it’s very important if we want to increase the level of playing and coaching in Oceania,” Flaccardi explained. Steven Dillon from New Zealand Football shared the sentiments of his Tahitian colleague. “We are very fortunate to have a number of representatives from FIFA here from all over the globe, as each one has a diverse range of experiences and skills that they have brought to us, and the impact they have will be longstanding well beyond the course. “I think one of the key things for us was to understand the role of the instructor and how that is different,’ Dillon said. “We now can take up the role of one that facilitates learning for coaches and the different skills that requires to run effective coach education sessions not just coaching sessions. FIFA experts were quick to point out that the past five days spent with the candidats have also helped them to better understand some of the unique challenges OFC member associations face. “It’s been really interesting and a little bit of an eyeopener for me to understand a little bit of the culture and life in Oceania,” John Peacock admitted. “It’s always important that we learn and at FIFA we are always keen to know exactly what is going on around the world as you can be very insular. “I think sometimes whether you are based in Europe or Africa or in America and you don’t quite know what’s going on in other parts of the world, and I think we have been very open and sharing that,” the FIFA expert said. Coming from an immensely diverse Condeferation that has 41 member asscociations and four official languages, CONCACAF Development Officer Etienne Siliee was also keen to stress the importance of understanding the specific needs of the individual MA’s. “There are a lot of similairites in terms of the challenges between OFC and CONCACAF and I was impressed especially when I heard about some of the backgrounds, traditions and the environments some of the participants have to work in,” he said. Despite different standards of lifestyle as well as the status of football in various member associations Etienne reamians fully committed to develop the game in every corner of the globe. “In some countries it’s normal to have professional status in other islands it’s more the recreational and social values of football that are important to them,” he says. “In CONCACAF you have the United States for example as one of our members with high economic scale and their standards of life and the way they deal with sport and you have member associations with maybe 12,000 people, but all of them are part of the CONCACAF family. It’s all about one important thing, football. “It doesn’t matter what the scale or the culture is but football has its principles and fundamentals and the objective of this course is to use the education tools as the important objectives to create standards and norms,” Etienne explained. Such goals are in reach for the participants if they receieve sufficent support from OFC and FIFA in terms of follow up courses and monitoring – according to Mohammed Basir. The FIFA expert heaped praise on the organisers before pointing out some of the fundamental building blocks of the next phase of development. “I felt that the course was fantastically organized and a lot of credit goes to OFC and Giovani (Fernandes) in particular. “When I was in AFC, I’ve organised such courses and I can tell you we’ve had the luxury of more staff, but I can see OFC is running on a basic skeleton crew but it has been fantastic in terms of logistics, preparations and facilities, so I’m very happy. “And based on the sharing that we have done and exchanges we’ve had between ourselves and the candidates as well as among the candidates themselves, I’m confident there will be quite a few things the participants will be able to take away and hopefully given the opportunity, they can apply and transfer. “Of course there will be follow up to this because there must be continuity, it cannot be a one-off event and that’s it, and the support has to continue both from FIFA to OFC and from the federations in the member associations,” Basir concluded.